AJOY Joshi is an Indian guru (well, he’s mine anyway). He is passionate about his former country’s cuisines (and I say cuisines because if you think Indian food is all the same then you are sadly mistaken as India has 28 regional States), and about cricket. I remember fondly taking Ajoy to the SCG to see India play Australia in a Test Match many years ago. There he was donning an Akubra hat in the Members’ Pavilion and enthusiastically rising out of his seat cheering whenever India scored a run (or when Australia only hit a four or a six), and passing around his sandwiches with his home-made Indian chutney to the delight of Members. But it is with the greatest admiration that I remember his teachings, and as most gurus do, they open your eyes. Know how much salt to add to each of your customer’s dishes (as salt signifies life and the only time it isn’t added is for food at funeral “wakes”). Never pass on your secrets to the white man. Ajoy mastered the first mantra but thankfully for me (and other young grasshoppers), he rejected the second. He is an enthusiastic teacher and not only enjoys demonstrating his techniques and sharing his secrets but he ensures that you must understand the cultural, religious and medicinal significance of the cuisine he has mastered such as Ayurveda, the traditional system of Hindu medicine based on the belief that all foods have different properties which can have a direct effect on health and well-being. Ajoy holds monthly classes in his St. Leonards restaurant, Nilgiri’s, is the author of four cooking books, was invited to be one of only 10 chefs in the world to contribute to the first comprehensive guide to Indian cooking: India Cookbook; has appeared on TV food shows, has a range of ready-to-cook products, and is an avid blogger. But foremost he is the guru in the kitchen and possibly one of the most talented Indian chefs in the country. His monthly menus are a showcase of 100s of Indian regional varieties (and from dining at Niligiri’s with my parents for close to 10 years you get to appreciate the fact that he knows them all). I dined there with the Baroness one February evening and the charismatic Ajoy greeted me at the door as an old friend does even though we hadn’t seen each other in a number of years. There are many parts to Nilgiri’s. As you enter you will notice to the right a small space (The Tiffin Room), which is where Ajoy has his thali set meals as well as dosai. In India Tiffin refers to snacks eaten in-between meals as well as those cylindrical steel metal containers packed with a worker’s lunch and delivered by a tiffinwala. For lunch and dinner you can go to Nilgiri’s and get a pretty damn good vegetarian or meat set with naan and rice (or one of Ajoy’s renowned dosa). It’s casual and quick dining for those who want to enjoy a taste of Nilgiri’s on the hop and without the formality. And, if you really are pressured for time, you can grab one of Ajoy’s Nilgiri’s @ Home range of ready-to-cook meals from the cooler or a jar of his famous date and tamarind chutney at the opposite wall. Behind the reception area is the restaurant’s largest banquet room which can seat over 80 guests. But it is upstairs where most diners will have their Nilgiri’s experience. Immediately you will notice the decor – it is painted in what could be described as a turmeric yellow tone which gives the whole restaurant a warm and calming glow. Of course, this decor is deliberate as turmeric has a special significance in Ayurvedic medicine as it is revered as a healer and prevents many ailments. It is also used in India as a skin cleanser and has wonderful antiseptic qualities. Many people gargle fresh turmeric juice and warm water for colds and fevers or take it as a herbal remedy to prevent such. When powered and added to food it becomes a natural colour enhancer – try a sprinkle of it on spinach or on tomatoes – it will bring out the greens and reds of the dish without spoiling the flavors. 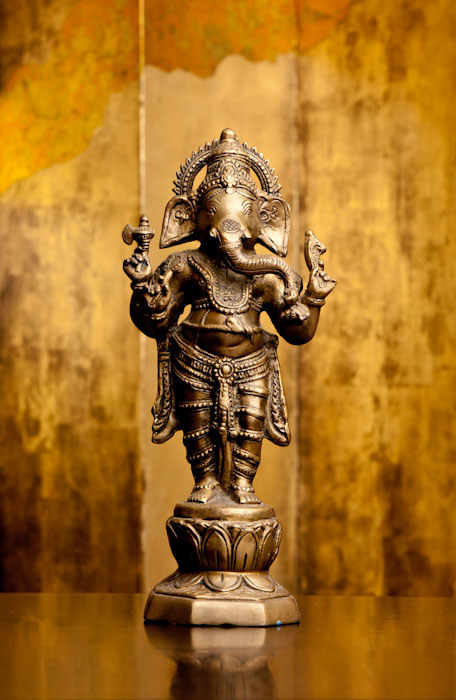 Throughout the restaurant you will also notice Ajoy’s wonderful eclectic collection of effigies of Ganesha (the remover of obstacles and God of beginnings) – big, small and tiny. Upstairs also houses four, beautifully-appointed private rooms that can seat from 8 to 14-odd guests. Tonight’s menu featured 11 entrée (five vegetarian) and 14 main course dishes (five vegetarian). Some of the entrée highlights included chicken tika (fenugreek spiced chicken thigh cooked in the tandoor – $17); seekh kebaba (skewers of lamb mince spiced with garam masala, fresh coriander and green chilies which is then cooked in the tandoor – $17); karwari jhinga (spinach and semolina crusted prawns tossed in a mint and spinach chutney – $19). Mains included a chicken biryani ($28); Goan prawns (grilled prawns in a chilli, vinegar and coconut sauce – $29); kozhi chettinad (chicken cooked with cracked pepper and fresh curry leaves – $27); and balti ka bakra (slow-cooked goat with whole spices and crushed tomatoes – $27). The other great thing about Nilgiri’s is not only does it have a well-considered and priced wine list, BYO is only $6 per bottle. 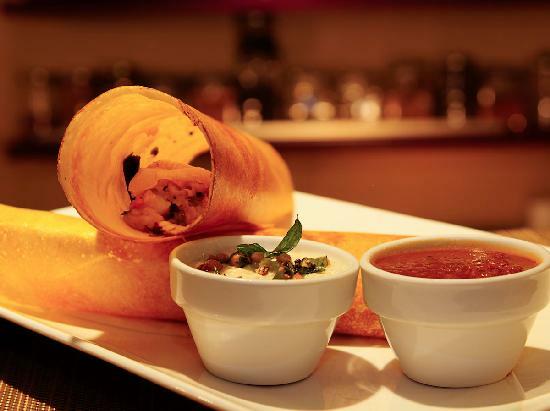 You cannot dine at Nilgiri’s without having a masala dosa ($18). If Ajoy had a “signature dish” – this would be it. The dosa was light and crisp, containing a wonderfully spiced potato masala with the predominance of cumin and mustard seed coming through. Served with fresh coconut chutney and a sambar (lentil soup) – this is South Indian comfort food at its best. The other entrée we shared was Golgappa ($16) which is a popular Indian street snack. These are hollow, ball-like fried crisp puri which are usually about golf-ball size so you can place them straight in your mouth. Nilgiri’s were a lot larger – probably deliberately so – as there was a lot of spiced chickpeas to be placed in these wonderful crisp balls. The spiced chickpeas were moist and “al-dente” and when spooned into the puri and then eaten, the whole combination was an interesting mouth fill of crunchy spiciness. Murg makhani ($27) is technically what us westerners would call butter chicken – a dish that typically is the first Indian cuisine experience of many Australians. Real butter chicken, that is, murg makhani, is not what you find in a high-turnover Indian food outlet. Murg makhani when done the “real” way is a flavoursome, delightful and soul-satisfying dish. Ajoy marinates diced chicken and then bakes it in the tandoor with a mixture of puree tomatoes, honey and dried fenugreek. Cooking the chicken in its own juices and the marinade produces tender and succulent pieces of meat which in turn makes its own rich and flavoursome sauce which is smooth and creamy with a wonderful balance of acidity from the tomatoes and creaminess of the chicken marinade. Slightly smoky from being left in the tandoor it is no doubt a sensory and comforting dish. One of the best. We also chose kadhai machchi ($29), a fillet of fish which had been crusted with a masala (with the predominate flavours of coriander, pepper and cumin and ginger coming through), which was then pan-fried and topped with a mustard-flavoured sauce. The fish was firm and moist, floating in a creamy, crushed mustard seed sauce which was rich and mild and extremely flavoursome. As accompaniments we had rice ($3) and shared a lasooni naan ($4.50) which is garlic-infused flat bread backed in the tandoor. It’s easy to over eat when sharing at an Indian restaurant but room must be left for one of the kulfi’s – which is a style of frozen milky dessert (much like ice-cream) but flavoured with typical Indian spice infusions – in this case we had the pista kulfi a pistachio and cardamom infused kulfi as well as the date and honey. The pista kulfi is a good introduction and will give you an appreciation to these styles of desserts as it combines the typical sweet/spicy flavours of cardamom with the milky sweetness from the condensed milk which is used as its make-up. The date and honey is, of course a lot sweeter, and is somewhat reminiscent of a frozen sticky date pudding. Both are good but I have a slight tendency towards the date and honey. Nilgiri’s is as authentic as ‘real’ Indian cooking can get and reflects the experience, care, love and precision that comes from a top chef. Rest assured you are in safe hands with the guru of Indian cooking in Australia -Ajoy Joshi. The verdict: This is real Indian cooking and where to come to sample good value and excellent regional dishes from the sub continent that are not run-of-the-mill. There is something for every one, from banquets to al la carte or quick lunches or weekend brunches. 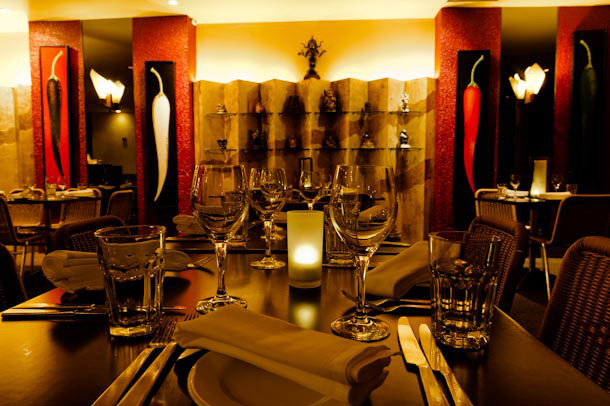 With a monthly changing menu highlighting regional specialities that you would not normally see in Australia – Nilgiri’s is a connoisseurs’ restaurant for fans of India’s marvellous and eclectic cuisine. This entry was posted in Indian, New South Wales, Sydney and tagged Ajoy Joshi, Crows Nest, Curry, Indian, Nilgiri's, St Leornards, Sydney. Bookmark the permalink.